Iranian Supreme Leader Ayatollah Ali Khamenei today reiterated his opposition to nuclear weapons. 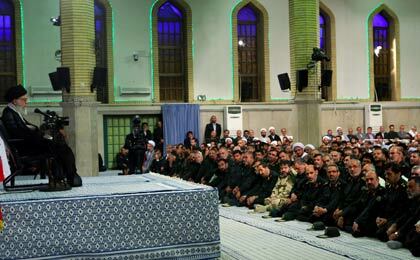 Khamenei made the comments during a Tuesday meeting with the commanders of the Islamic Revolution Guards Corps (IRGC). Anytime dumb enough to take an iranians word deserves what they get. Of course the regime doesn't want nuclear weapons. That's why they have developed missiles to deliver flowers. Would that be instead of the zionist regime who has only developed missiles and a covert nuclear weapons programme while not joining the NPT (which Iran has) and not accepting a single nuclear inspection (while Iran has) , just to deliver flowers and all that free money from American taxpayers? are you referring to the space monkey? Iran signed the NPT and that's why nuclear weapons are not allowed.Israel,India,Pakistan haven't signed the NPT and has nuclear weapones.So what besides your propaganda rubbish are you trying to tell me? Anon 9:54 PM, well said. Anon 8:11 PM, that means that people who live in glass houses shouldn't throw stones. zionists and Americans have no right to criticise Iran for developing missiles and nuclear power, when they have done the same and even more. It looks like you are trying to say that because the zionist occupation and others did not join the NPT, that makes it fine for them to develop a covert nuclear weapons programme. Resort to the old, zionist and western double standards. I think he is referring to persian sage sausages. Get your facts right! The NPT wasn't signed by this two faced regime. Get YOUR facts right, Anon 9:45 AM. It makes no difference which regime signed Iran into the NPT, Iran is still a member of it.